StoneGard LP | Hawk Research Laboratories, LLC. StoneGard topcoat system is a fortified urethane topcoat designed for use with multicolor finishes on countertops. 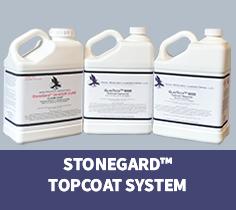 StoneGard topcoat system is designed to interface with StoneFlecks™ multicolor finish during the curing cycle, and its moisture scavenging agents allow for fast top coating over waterborne coatings like StoneFlecks and Multispec® multicolor finishes. Mix 2:1 with GlasTech™ 9000 Catalyst. StoneGard Lo topcoat system is low odor, VOC compliant, fortified urethane topcoat designed for use with multicolor finishes on countertops. 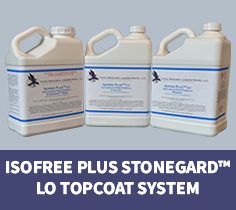 The StoneGard Lo topcoat system has a VOC level less than 350 g/l and a significantly reduced odor, while maintaining the same coverage and performance as the traditional system. 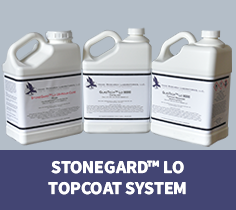 StoneGard Lo topcoat system is designed to interface with StoneFlecks multicolor finish during the curing cycle, and its moisture scavenging agents allow for fast top coating over waterborne coatings like StoneFlecks and Multispec® multicolor finishes. 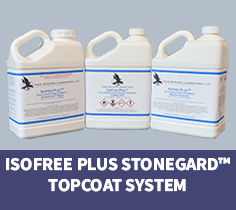 IsoFree Plus StoneGard Lo topcoat is a two-component, fast-drying system designed to provide outstanding dry film characteristics in an isocyanate-free formula. IsoFree Plus StoneGard Lo topcoat delivers maximum protection and coating lifespan for Hawk’s StoneFlecks Ultra multicolor finish for countertops.